CHRIS Hughton is not the type of person to make a mountain out of a molehill or a drama out of a crisis, but even he must have wondered whether his job is worth the hassle this week. ANDY Carroll still has a mountain to climb to make the England squad – despite the Three Lions’ dire display against Montenegro. ANDY Carroll believes he is ready to play for England after taking lessons in life from Kevin Nolan. NEWCASTLE United striker Andy Carroll will be named in the England squad for the first time on Monday. STEVE Bruce fears he will be the victim of another Sir Alex Ferguson curve ball this weekend as he has a sneaky suspicion Sunderland will have to deal with Wayne Rooney. JOEY Barton has defended the right of every footballer to enjoy a physical challenge following Arsene Wenger’s most recent complaint about the violent nature of tackling in the Premier League. DARREN Bent has thanked Sunderland’s supporters for helping him rebuild his career and revealed that after little over a year in the region he feels like a fully-fledged Wearsider. DARREN Bent will hope to profit from Peter Crouch’s back injury as the Sunderland striker looks to prove how foolish it was to leave him out of England’s World Cup squad. NEWCASTLE United’s newest hat-trick hero Andy Carroll can have a big future in the England set-up, according to World Cup winger Jonás Gutiérrez. 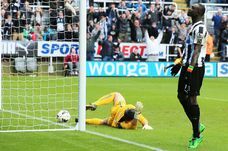 NEWCASTLE returned to the Premier League with a bump on Monday but, Mike Williamson tells Stuart Rayner, it did nothing to dishearten him. CHRIS Hughton reckons Mike Williamson and James Perch passed their first Premier League test with flying colours – but has warned both there will be no let-up as Newcastle United strive for top flight safety. NEWCASTLE United returned to the Premier League with a visit to the Theatre of Dreams – but this was more of a rude awakening for watching owner Mike Ashley. CHRIS Hughton will send Newcastle United into their 17th season of Premier League football telling them the pressure is off. DARREN Bent is a doubt for Sunderland’s first Premier League game of the season after missing his chance to be part of Fabio Capello’s new-look England side with a back injury. DARREN Bent is back in the England squad following his World Cup disappointment, writes MARK DOUGLAS. IF Darren Bent is honest, he is still coming to terms with Fabio Capello’s decision not to take him to South Africa. WHEN Fabio Capello took to the stage for his final World Cup press conference in Rustenburg yesterday, he looked every bit the Emperor stripped naked. ALAN Shearer has no doubts about Wayne Rooney’s ability to control his temper as he predicted the England striker could become the star of the World Cup. NIALL Quinn believes the fans will determine the success of this year’s World Cup – and Sunderland’s chairman cannot hide his excitement about what it could do for England in 2018. ENGLAND’S Golden Generation were a fugazy; a fake, a fraud and they left an entire nation feeling as though it had been ripped off. PRESUMABLY, Fabio Capello’s copy of ‘One Night In Turin’ got lost in the post. SUNDERLAND hope to persuade goalkeeper Simon Mignolet his future lies on Wearside after seeing the Lights this weekend. DARREN Bent's World Cup dream was hanging by the thinnest of threads after the Sunderland striker was forced to miss last night's 3-1 win over Mexico with a hamstring strain. ENGLAND World Cup hopeful Darren Bent is confident he can produce the goods if he is given his chance on the biggest stage of all. TERRY Venables has thrown his weight behind Darren Bent’s bid to force his way into England’s World Cup squad as he argued it was impossible to ignore someone who had scored so many goals for Sunderland last season. NIALL Quinn thinks Sunderland will reap the rewards if Darren Bent is picked for this summer’s World Cup, writes STUART RAYNER. STEVE Bruce was reminded of the task facing him this summer after blaming a lack of quality for Sunderland’s failure to finish a season of immense progress at the Stadium of Light on a high. IT ENDED as it began for Sunderland, heads bowed after being outclassed by one of the finest teams in the land. IT does not matter whether you analyse his performances or pour over the statistics, Darren Bent should be playing for England in this summer’s World Cup. STEVE Bruce reflected on £15m well spent after Darren Bent’s 25th goal this season condemned Hull City to Premier League relegation and allowed a Sunderland side on a par with them 12 months ago to dream of a top-ten finish. Sunderland’s in-form forward Fraizer Campbell is in too much of a rush to spend time dwelling on the past. FORGET Wayne Rooney or Fernando Torres – Craig Gordon has been the best player in the Premier League over the last month – according to boss Steve Bruce.